I never dreamed that, after quitting my London consulting job, I’d end up starting an award-winning social enterprise 4,000 miles away. It all began with me sitting in a dull corporate office longing to do something more meaningful with my life. My heart led me to social entrepreneurs: people using entrepreneurial skills to solve social problems (Muhammad Yunus is one prominent example). In 2005, I travelled to the hot, dusty plains of northern India with Pooja, who was to become my future business partner. We were so inspired by the potential of social entrepreneurs to create powerful change in India and so moved by the lack of support for them, that we started to hatch a plan for how we could help. Wealth Dynamics (WD) When I discovered WD, it was a lightbulb moment for me. I suddenly understood that there were different paths to entrepreneurial success. I am a Creator profile. I learned that I need to focus my time on creating, not on managing or completing. And I need to work with different profiles that love doing what I don’t. Now, I felt better equipped for my journey — or so I thought. The big lessons I’m still learning As UnLtd India, our social entrepreneur incubator, took off, I found myself feeling almost constantly overwhelmed. I was exhausted, I was working every hour of the day and my relationships were suffering. I slowly learned my first big lesson from WD: ‘Say NO’. I learned that it’s what I say ‘no’ to, rather than ‘yes’ to, that determines how effective I am. Since then, I’ve said ‘no’ to doing things that are not aligned with my creator profile — admin, finances and implementation — so that I can focus on creating, raising money and strategy. My second big lesson hit home when I went to a WD event in Bali, before I’d even moved to India. The event was run as a competition, with prizes for the team that developed the best business plan. My idea was one that was chosen. I thought I was in with a chance of winning. But I crashed into something bigger than my dreams: my ego. I thought I knew best. I thought we could do it MY way. We didn’t win because I shut out my team. It felt painful and humiliating. Now, I’ve learned to let go more. My co-founder Pooja is a Supporter profile (a great combination for a Creator profile like me) and we’ve learned to trust each other completely for the different things we do. Our first key hire, our Operations Manager, is an Accumulator profile, who keeps us anchored. We’ve since built an awe-inspiring team made up of complementary profiles — so much so, that now, Pooja and I are doing what feels scary (but right), and handing over the organisation to allow someone else to take it to the next level. The results Today, we’ve raised more than $2m, funded 98 entrepreneurs and built a full-time team of 14. The people we’ve mentored have already raised 14.5 times the amount we’ve invested in them and positively impacted the lives of more than four million disadvantaged people in India. Last year, we were honoured to win the ‘Most Innovative Social Enterprise Award’ from The Indus Entrepreneurs (TiE). I’m deeply grateful to Roger and to the amazing people I’ve met through WD who have supported us. Had I not discovered WD, I suspect we may not have achieved what we have, and that I’d be less happy, less fulfilled and more grey-haired than I am now! What next? Because WD has had such a profound influence on my life, I am now launching WD for social entrepreneurs, incorporating language and case studies that speak directly to them. If you’re interested in helping, I’d love to hear from you! 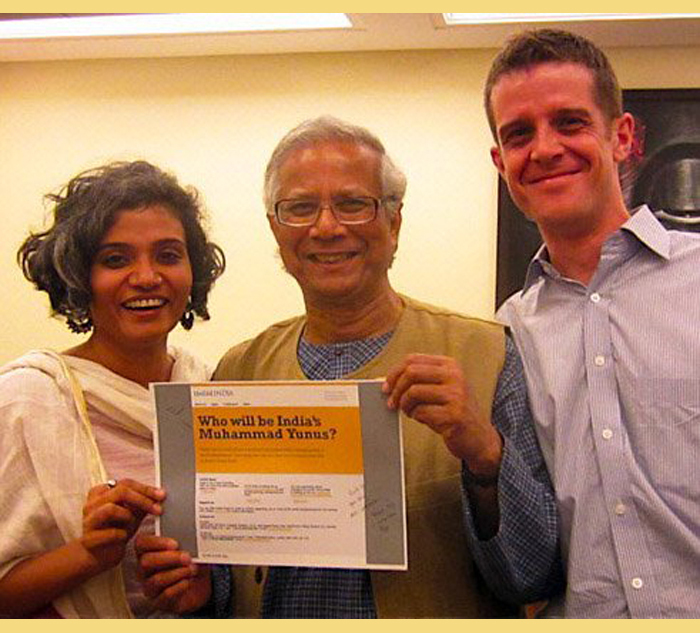 – PS Our first UnLtd India website had the strapline ‘Who will be India’s Muhammad Yunus?’ The photo on the left is of Pooja and I saying ‘thank you’ to the man himself in Mumbai earlier this year.